Buenos Días Catering and Events is Verde Cocina’s full service catering company dedicated to bringing our NW fresh menus to parties and events of all sizes. Lead chef and co-proprietor, Noé Garnica, is a native of Arperos - a small “rancho” (village) outside of Guanajuato in south-central Mexico. His dishes have received widespread acclaim by local and national media such as EATER, AFAR, Martha Stewart, Portland Monthly and the Oregonian for their unique fusion of fresh, NW ingredients with Mexican flair. 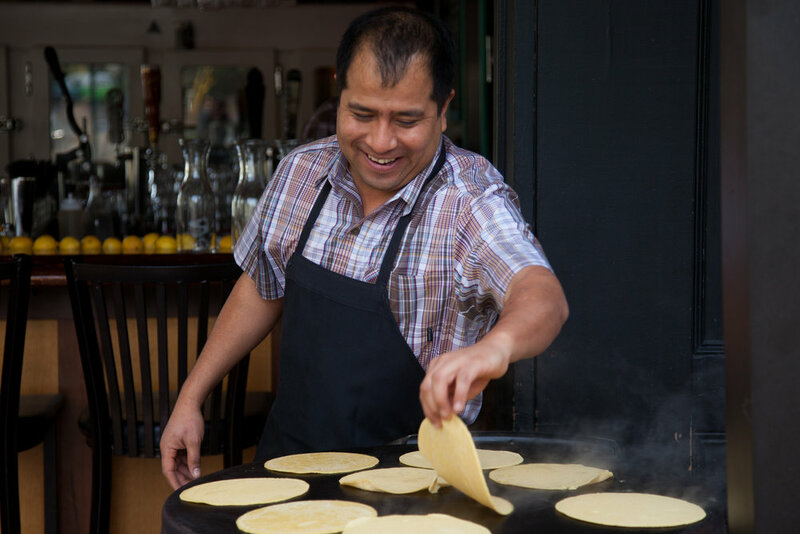 Noé owes much of his traditional Mexican culinary knowledge to his family, learning from helping his mother and tías make corn tortillas from scratch and savory dishes cooked in large pots over an open fire in the fogata – an outdoor kitchen attached to his family’s home. Noé’s heritage is notable but what truly inspires the dishes he creates today is the amazing fresh bounty of the Pacific Northwest. When Noé first moved to the US he didn't like what he found referred to as “authentic” Mexican cuisine. The food tended to be heavy and lacking in fresh ingredients. This observation became a growing desire to present Mexican food in a new light – using the freshest ingredients sourced locally and regionally as much as possible. The recipes Noé developed also had to consider a growing number of dietary lifestyles. This consideration Noé credits his wife and co-proprietor Anna Garnica for. From her own personal experience and that of friends and family, Anna recognized a need, for dishes free of known allergens such as gluten, dairy, and soy; and options for individuals following vegan or Paleolithic diets. Since our start in 2009, we’ve provided our made-to-order menus at events of all sizes, the largest being the Portland Farmers Market at PSU. You can find our team at our Verde Cocina booth year-round on Saturdays to get an idea of what we offer on a large scale or you join us at a Verde Cocina café to see a wider selection of the entrees we make fresh daily. "Everything was so delicious and fresh. I highly recommend them for a small or large event."